Starting a career in health care after earning a certification or degree can be a challenge. Once training has been completed, graduates feel euphoric, accomplished, and eager to start a job search. The reality, however, is that it can be difficult getting that proverbial foot in the door without hands-on experience. For example, I chose my career in college. I applied at a hospital for a coding position only to be told I didn't have any experience. It's a common phrase many coders hear as they begin their careers. That leads to the question, "How do I get experience if no one is willing to give me the opportunity?" To better understand what it takes to earn that elusive first job, let's hear from experienced coders to learn how they managed the trick. I started working part time while in college, making minimum wage in a private practice with two full-time physicians and one semiretired physician. My job was to relieve the full-time checkout clerk at 3 PM. I filed charts, copied records, submitted invoices, answered phones, brought patients to rooms, and anything else that was asked of me. This job opened doors for me; today, I love my position and would not trade it for anything. Career success takes time, hard work, and dedication, but that's what makes it so rewarding. Jones was promoted to a coding reimbursement specialist I at Carolinas Health Care System in March 2016 after obtaining her certified professional coder (CPC) credential in November 2015. Prior to earning her certification, she worked in charge entry, entering daily encounter forms for a multispecialty practice. When Jones earned her CPC, she interviewed for several coding positions in different departments at Carolinas Health Care System. During her four-month job search, Jones viewed her current position as an educational opportunity. She looked at the coding aspect in charge entry and learned as much as possible while being patient in her quest to be a coder. "The hardest part is over, and it's that exam. The right opportunity for you is out there. This is a great field to be in. I started with my company in medical records just to get my foot in the door and I worked my way up to my current coding position. Finding your niche and trusting your education is key." When job searching, "Utilize your local [AAPC] chapter," Jones says. "They are a great resource and community to have. AAPC forums are very helpful, too." Jones has been enjoying her current position as an emergency coder for more than a year. Paris, a coder at Endeavor Medical Systems, a division of the Larkin Group, has been in her position for two months. After Paris obtained her certification, she applied for more than 100 jobs, earning about 20 interviews. Her search lasted approximately two months. "The process has taught me that if you give up, you won't succeed," Paris says. "But if you keep trying and give it your all, you will pass your certification test and you will earn a job." Ryen, a full-time remote inpatient coder at Ochsner Hospital in New Orleans, had to hurdle numerous obstacles to gain that position. Ryen never had the opportunity to go to college, so she joined the labor force. By the time she turned 50, however, her body couldn't handle the strain anymore. Realizing she needed a change of pace, she enrolled in a medical coding course. Ryen, who graduated on the honor roll, says it was one of the most challenging things she ever did, but it provided her with the skills she would need later. She is a big advocate of volunteer work. Ryen joined AAPC as a student member when she was in school and went on to volunteer as secretary for the local chapter in Covington, Louisiana. Ryen also volunteered a couple of hours per week at a local hospital. She filled in wherever she was needed (pro re nata), including the surgery waiting room where she greeted patients and families. She also helped organize schedules, assist doctors in keeping order, and locate families for nurses. Through her volunteer work, Ryen gained experience working with physicians, nurses, patients, and an officer at her local chapter. Ryen built employment profiles on hospital websites and drove to every health care job board to determine whether there were any openings. She sought positions in coding, billing, registration, and administration—she even applied for a position as an orderly. 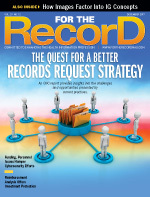 • how to navigate EHRs. Ryen built her résumé by highlighting these newly acquired skills. Acting on a tip from a contact she met while serving as an AAPC officer, she was hired at an urgent care clinic 11 months later. With no experience, Ryen had difficulty adjusting to her new job, which involved auditing and coding. She was forced to research many things, but in the process learned how to defend her work by citing guidelines and discovered new concepts when she was incorrect. Seven months later, due to the economy, she was laid off and had to restart her job search. Ryen again flooded the market with résumés. She had a lot of great conversations with employers and received a few new job search tips. Two months later, Ryen accepted an internship as an inpatient coder, a position she earned largely because she was comfortable talking to patients and medical professionals, navigating an EHR, researching codes and compliance issues, working pro re nata, scanning documents, and volunteering as an officer at her local AAPC chapter. Ryen says there were days when she would cry all the way home (it was a two-hour commute) to relieve the stress, but she got a good night's sleep and was back at it in the morning. Eventually she earned the trust of her employers and they agreed to let her work remotely. Ryen's dedication and volunteer experience speaks volumes. Now serving as president of the Covington, Louisiana, AAPC chapter, she offers the following advice: "I still research like a madman and have some pretty stressful days. But all the struggle paid off. Everyone in my school class five years ago is a coder. Not one of them had a coding job first. They started at a billing company or at a legal company, driving to doctors' offices and taking pictures of documents or posting payments and codes from scrolls or at front desk jobs. Emergency departments and physician offices are good starts, and many contract companies give new coders chances. LinkedIn and Facebook job pages are other good resources. Get involved in everything coding, but be open minded if you can't start there. New coders get a break every day. Be persistent. Never give up." Finding that first job in your chosen profession is rarely easy. Sometimes it starts with low pay and the feeling you may be in over your head. If you are running a tough race, stay positive. Stay determined and passionate. And don't forget to tap into your local AAPC chapter, where you can network and lean on a support system. — Angela Clements, CPC, CPC-I, CEMC, CGSC, COSC, CCS, AAPC Fellow, is a physician coding auditor, educator, and consultant at Medkoder. A member of the Covington, Louisiana, AAPC chapter, she also serves on the AAPC National Advisory Board as the member relations officer.